Sierra Nevada: snow ski near marbella! Sierra Nevada is the largest ski resort in Andalusia and is only 30 minutes away from Granada. This is the closest ski resort from Marbella and you can reach the summit by car in less than 3 hours on a normal day. Check out the Marbella Ski Club for family ski packages, lift tickets and more. Sierra Nevada includes the highest peak on the Spanish continent, known as Mulhacén at 3,479 metres (11,414 ft). It is a highly popular tourist destination which includes high peaks make skiing possible in Europe's most southern ski resort. Can you believe that an area along the Mediterranean Sea - predominantly known for its warm temperatures and abundant sunshine - is also a skiing destination? Sierra Nevada has a beautiful flora and fauna when there is no snow. This is an amazing resort that shows the south of Spain really does have it all! The season traditionally starts in November and lasts through the first week of May. The mountain consists of 18 green runs, 42 blue runs, 53 red runs and 7 black runs. I think we all know what that means: which runs will you be sliding down this year? 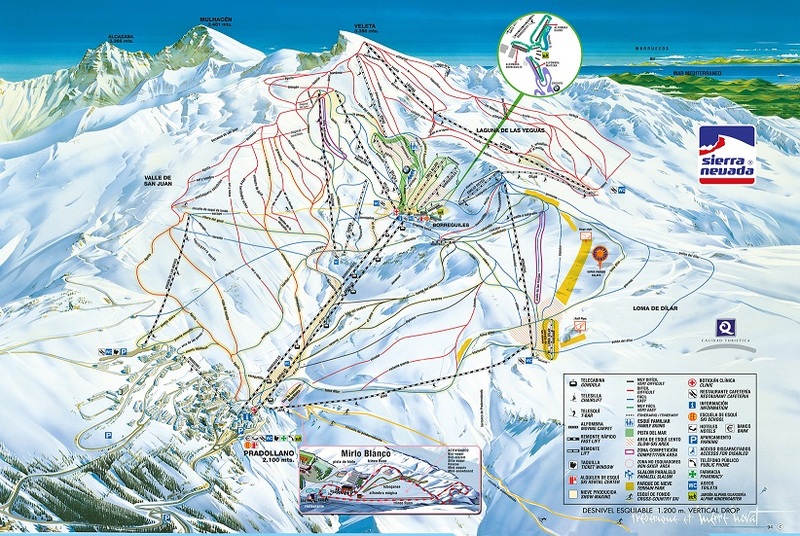 There are 22 lifts and the opening times are approximately 9:00 - 17:00. Although they can change due to weather conditions and super fun night time activities and special events, where they will let skiers, snowboarders, sledders and professional snowman creators enjoy the snow at night time. There a number of hotels and resorts, restaurants and bars, ski equipment hire and lessons, lift passes discounts, programes and trips to cater everyone who wishes to take a trip to Sierra Nevada. How to get there: The ski resort is located in the municipality of Monachil, about 25 minutes away from Granada. From Marbella, you can follow the direction Malaga, then Granada, then you can follow the signs. It takes about two and a half hours on normal days. Mom's evaluation: I am not a big skier, but really enjoyed skiing in Sierra Nevada. There is plenty of snow in high season and there are snow machines in case there isn't. Lots of green slopes for beginners. Skiing with plenty of sunshine is a wonderful experience and there is plenty of it in Spain. The village itself is small, but very quaint with many ski shops and cafes to choose from. I loved eating a fondue in the local cafe and sitting outside with a beer and snack apres-ski, soaking up the warm Spanish sun. It's nice to combine this trip in March/April at the end of the season with a trip to Granada just 25 minutes away. You'll be amazed that you went from skiing in a winter wonderland to sun bathing on warm beaches in 25 minutes. The difference is literally that great at that time. Don't forget to make some time to ice skate in the village ice skating rink (they rent skates), roller-sled, innertubing and bike ski in the Mirlo Blanco activity zone. You can also go sledging in an area nearby. You can actually go skiing for the day from Marbella (more easily if you're closer to Sierra Nevada) if you wake up early and get organized. You can easily reach the slopes by 9:00-10:00am, ski all day and get back to Marbella by 9:00 pm. I know a group of mothers from Sotogrande who go regularly for half a day of skiing and get back in time to pick up their kids from school by 4:30pm. Personally, I prefer to spend more time and book myself into a hotel. We have stayed at the Melia Sierra Nevada, a four-star hotel conveniently located next to the chair lifts, and enjoyed our stay there. You can find more budget accomodation by staying further away from the ski lifts, but then you'll have to walk a distance or drive to get to the lifts. Hotels near the lift are convenient, because they offer lockers in the hotel basement to store your equipment. However, I heard you can also store them in lockers that are available for rent near the lifts. I definitely recommend organizing ski lessons for young children as it will give you some free time to ski or take a lesson of your own. There are so many schools to choose from and give special offers if you rent their equipment. We were satisfied with our experience with the Escuela Internacional de Esqui (International School of Skiing) that gave lessons to both us (parents) and our kids (I suggest you do this sepearately) as well as equipped us all. The school was right across from our hotel, so we didn't have to lug lots of equipment too far. Most ski schools and services in Sierra Nevada speak English. If you don´t have any ski clothing with you, or don´t want to lug heavy clothes, you can rent everything from ski suits to gloves and glasses in one of the shops at the Hotel Sol y Melia shopping center. One of the readers on the site asked about ski clothing hire, which you may find useful. In any case, making a ski trip with kids will go much more smoothly when you get organized. There are plenty of English-language websites about Sierra Nevada and its facilities, so do your research before you go. If you can´t be bothered you may want to try booking a ski trip with Team Xtreme. We tried their services when we went canyoning with the kids and were very impressed by their professionalism, attention to detail (saftety! ), organization and pleasant manner. For more information, check out the official page on the Sierra Nevada Ski Resort. have a question about sierra nevada or skiing?